Paying sales tax can sting, particularly when you're purchasing a big-ticket item like an automobile. However, there may be a silver lining. Sales taxes you pay during the course of the year can be a deduction against your federal income taxes, subject to certain rules. One of those rules is that it's an itemized deduction, so you must claim it on Schedule A when you prepare your return. This isn't always advantageous for everyone. You can deduct state and local income taxes at tax time or sales taxes that you paid during the year, but you can't claim both – you have to choose. The sales tax deduction works best for people who live in states with no income tax, or whose sales tax deduction is larger than their state income tax deduction would be. If your state has a significant income tax rate, you'd have tallied up a lot of sales taxes during the year to make this deduction worth your while. You have two options for calculating your sales tax deduction should you decide to take it. You can use your actual sales tax expenses or the optional sales tax tables. The actual sales tax method is easy, at least on the surface. Just keep all of your receipts all year and add them up. Your deduction is the total amount of the sales taxes you paid. This method requires a tremendous amount of record-keeping, but it can result in a higher deduction. You can make it easier on yourself by saving your receipts and maintaining a spreadsheet if you have the discipline to enter the sales tax from each receipt on a regular basis and keep a running tally. Otherwise, you'll be faced with a mountain of receipts at tax time, faced with the odious challenge of adding them all up. Consider a personal finance app for your smartphone – many allow you to snap pictures of your receipts and will keep track of them for you as you spend and collect them. 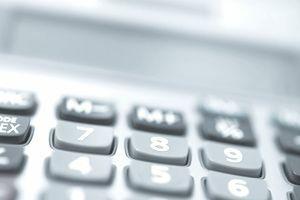 The Internal Revenue Service provides a sales tax calculator that you can use for small, everyday expenditures, then you can add on sales taxes you paid on the purchase or lease of a vehicle, the purchase of a boat or aircraft, and/or the purchase of or substantial addition or renovation to your home. The IRS even offers a worksheet in its Instructions for Schedule A to help you keep track of these figures. The IRS tables are broken down by your state, your income and the number of exemptions you claim. The numbers are an estimation by the IRS as to how much you probably spent on sales tax for everyday items based on these factors. Some states have higher sales taxes than others. People with more income at their disposal tend to spend more. If you actually spent less than this number the IRS assigns to you, you're better off using the tables. If you think you spent more, start adding up those receipts – you'll get a better deduction. People who claim the sales tax deduction don't have to report state income tax refunds as taxable income the following year, so if your sales tax deduction is about the same as your income tax deduction would be, you'll probably come out ahead by taking the sales tax deduction. Keep receipts showing the sales tax you paid for cars, boats, airplanes, and home improvements if you're using the optional sales tax table method – these are all you'll need. Then you can add these amounts to the deduction listed for your circumstances in the tables. If you're using the actual expense method, you'll have to keep all receipts for purchases you made that incurred sales taxes. If you file your federal taxes using the married filing separately status, you and your spouse must both itemize or you must both take the standard deduction. If you're itemizing, both of you must take either the state income tax deduction or the sales tax deduction. The tax laws don't allow for mixing-and-matching of these deductions.